A state agency responsible for cows, pigs, and goats will take charge of sterilising 100,000 dogs this year from the first quarter, while animal welfare groups say the department that gives advice on farm animals is amateurish. The Department of Animal Production and Health will get Rs 150 million and one million doses of the rabies vaccine from the Health Ministry to start the programme in March. “They could request for more funds if needed,” deputy director general, public health services, Dr Sarath Amunugama said. DAPH, director general, Dr Nihal Vethasinghe, appointed only last week, said discussions have begun with provincial DAPH offices, the Health Ministry, welfare associations, and other stakeholders on how best to implement the programme. More than 100,000 female dogs will be sterilised this year through the DAPH’s 328 veterinary service divisions in nine provinces, he said. Meanwhile, animal welfare associations have said that the sterilisation programme should begin this month, and not in March. A committee of over 20 animal welfare associations appointed by the Health Ministry to look into an effective way to eradicate rabies, said, sterilisations should start at the start of the year. A delay will create conditions for an increase in the dog population. “Dogs litter twice a year and this will result in the failure of the programme. We cannot afford this lapse. This will jeopardise the entire process of eradicating rabies in dogs by 2020,’’ the Alliance for the Protection of Community Dogs said. Alliance member, Dr Chamith Nanayakara said the department is an amateur and is overwhelmed. Without proper planning, the whole programme could be in jeopardy. “Sterilisations should start this month and should go on till December every year,’’ he said. But the department has one advantage in that it has around 550 veterinary surgeons across the country. It also could employ graduates who are seeking internships. Several animal welfare associations said they were ready to help. The Kandy Association for Community Protection through Animal Welfare, veterinarian, Champa Fernando, said a break or a lull in the programme will negate results achieved in the past 10 years. She said that the pilot project of sterilisation and vaccination by the group in Nuwara Eliya and Kandy had been a success. “There is awareness among the public and they are willing to have their dogs vaccinated,’’ she said. Dr Nanayakara said efficient dog catchers were also needed to grab the community dogs and strays. 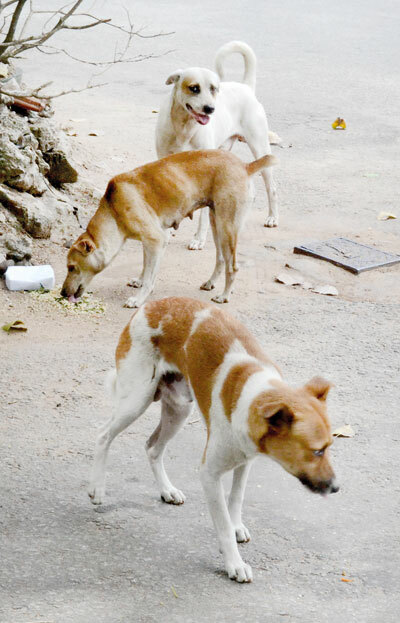 Sri Lanka is aiming to be free of dog infected rabies by 2020. However, last year, there were 15 human deaths by dog infected rabies. In 2016, 18 deaths were reported. In 1971, human rabies was declared a notifiable disease, following which, in 1975, a countrywide comprehensive rabies-control programme was launched. The Health Ministry website claims that the number of deaths by human rabies declined from 377 in 1973 to 14 in 2014. The original plan was to sterilise one million dogs in five years, but the Ministry of Health fell way short at 900,000 sterilisations in 10 years.